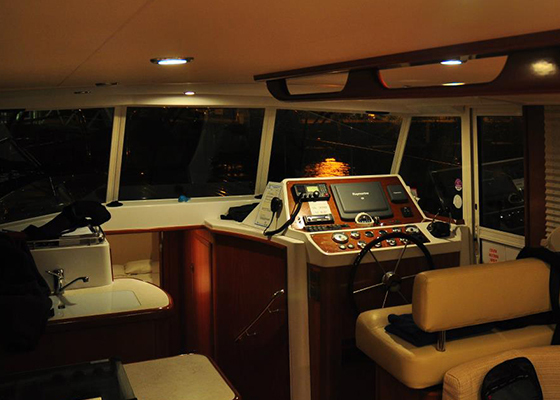 If you are new to motor cruising and want to take some training, you should first decide what kinds of motor vessels you want to be able to operate or crew, and what your objectives are in terms of skill levels, leisure or professional qualifications. Elite Sailing is an approved Royal Yachting Association Training Centre and we are inspected annually by the RYA to ensure that our methods, equipment and training standards are maintained at a high level. Our training follows the RYA Motor Cruising scheme – a world-renowned sequence of courses leading from basic Helmsman up to professional Yachtmaster. Certificates are awarded for satisfactory completion of each course and, for those who want a formally recognised “ticket”, there are independent examinations for issue of “Yachtmaster Coastal” and “Yachtmaster Offshore ” Certificates of Competence. 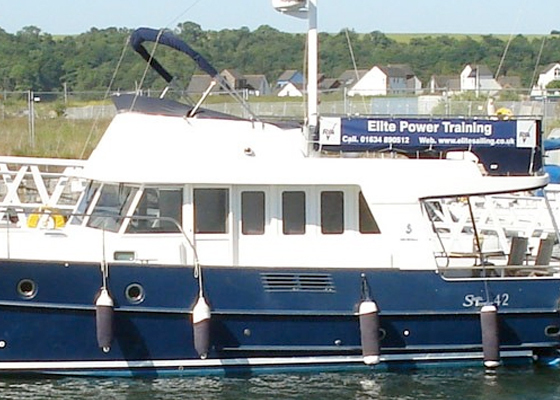 Motor cruising courses are appropriate for vessels that are designed for cruising in coastal or offshore waters – or equivalent commercial applications where there is usually an accomodation space, and either the vessel has twin engines (shaft or outdrive) or is more than 10 metres long (with any propulsion configuration). However, If you are only interested in vessels of under 10 metres with a single engine (such as a RIB with an outboard motor – or a small angling boat with a single engine, or a small sports cruiser with a single steerable outdrive), then it would be more appropriate to attend an RYA Powerboat Course rather than a Motor Cruising course. Elite Sailing does not offer Powerboat courses and we recommend that you go to the the RYA website to find a school. 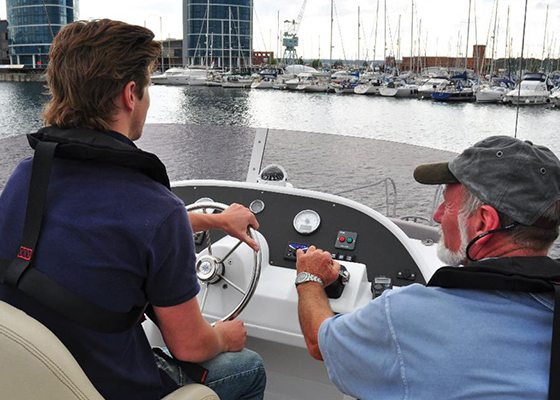 The standard motor cruising course for beginners is the RYA Helmsman course. This is a 2 days practical course aboard a motor cruiser. If you have no previous experience then you should start here. Its also a very good course if you want to be able to crew a motor cruiser but have no plans to go on to skipper qualifications. However, if you already have experience in driving and berthing a motor cruiser and know about all the safety precautions, preparation for sea, engine checks, ropework etc then you can by-pass the helmsman course. The next step is the Day Skipper Theory course. This is a classroom course in navigation and seamanship, including all the theory knowledge required to navigate and pilot the vessel and understand buoyage, lights, rules for preventing collisions, weather and so on. The course is common to motor and sailing yachts. Unless you already have good knowledge of all these topics by virtue of experience, it is essential to complete this course before going on to the Day Skipper practical course. The course requires 5 days in the classroom, but there are also options for courses over two weekends, or evening classes, or home study (distance learning). 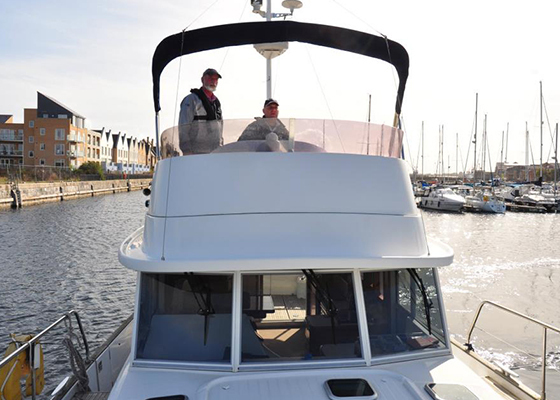 Day Skipper Practical is the first course in taking charge of a motor cruiser and taking responsibility for all aspects of safety, operation, manoeuvring in harbour, navigation and passage planning. Unless you already have considerable experience as a skipper (sail or power) you should complete this course. We offer it either over 4 consecutive days, or over 2 weekends. If you are starting with a Helmsman course and intend to complete day skipper practical too, you can attend a Combined Helmsman/Day Skipper Practical course over 5 days. In this case you should complete the day skipper theory course beforehand. On successful completion of the Day Skipper theory and practical courses you will qualify for the International certificate of Competence. If you are already at or above Day Skipper practical standard and have some experience as a skipper in charge of a motor cruiser, you can extend your knowledge of navigation, meteorology, vessel stability and rules of the road by attending a Coastal Skipper and Yachtmaster Theory course. This course is an essential requirement before undertaking a Coastal Skipper practical course. The most advanced formal RYA practical training course is Coastal Skipper. This is a 5 day course where you live aboard, undertake slightly longer passages, learn more about coastal passage-making, boat handling in confined spaces, night pilotage etc. It is designed to raise skills to the point where you can plan and execute safe coastal passages by day or night in a wider range of weather conditions and with more challenging pilotage and boat handling situations. If you complete any of the RYA courses mentioned above, you will receive an RYA Course Completion Certificate. For the practical courses there is no formal exam and provided that you complete the course and demonstate basic knowledge and competence at the level of the course, you will get the certificate. The day and coastal skipper certificates may be endorsed for commercial use but there are strict geographic limitations. If you wish to go further, you can apply to have an independent examination for the RYA/MCA Yachtmaster Certificate of Competence. The exam can be taken at either the Coastal or Offshore levels and the resulting certificate has wide recognition and can be endorsed for commercial use in coastal or offshore waters. The RYA Yachtmaster certificates are seen as the ultimate mark of expertise as a small-craft skipper and many leisure yachtsmen with no intention to work commercially often choose to follow this path too.